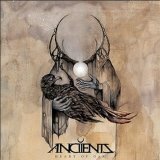 Canadian newcomers Anciients are poised to become the Next Big Thing, their mixture of progressive metal with a big pinch of doom and a smaller pinch of melodeath attracting attention from everywhere. And being fair to the band, Heart of Oak is an excellent debut release – it’s ridiculously skilfully-played, very ambitious, clearly a work of some love by the band. Where it stumbles is that despite all the skilful playing, Anciients haven’t the first clue about songcraft, throwing the entire kitchen sink at you constantly and rarely managing to make their music memorable. Guitarists (and vocalists) Chris Dyck and Kenneth Paul Cook are excellent, mixing in a huge variety of licks and noodles, riffs and grooves, but when it comes to constructing a song out of it all then much work is still to be done. It’s almost as if the two wanted the music to revolve around themselves and their talents without quite thinking of making it about more than them – and that isn’t necessarily a negative jibe, because many successful bands have done the same – but it doesn’t lend itself well to memorable songs. That isn’t to say that listening to Heart of Oak isn’t a pleasant experience, far from it. The opening strands of Falling in Line are laid back and blissful, classic rock strums that turn into melodic lead widdles before launching into the driving, complex riff that propels the song onwards. It’s an eight-minuter though, and Anciients make you work at it, drawing the track out with a later churning section that would have best been left on the cutting floor. The Longest River follows at over nine minutes and repeats the sins, building up with a seemingly endless set of grooving riffs that continues for a full three minutes before the vocals start up with some typical stoner nonsense about a wandering nomad. It’s like Crack The Skye-era Mastodon on crack; absolutely full of itself and never content to allow the music to work its magic on you when it could be launching into a thrash gallop or slowing the riffs to doom metal speed - or both! Of the nine tracks here, the only one under the six-minute mark is minute-long interlude One Foot in the Light. There’s not a single other song that wouldn’t seriously benefit from being cut down, from Giants surrounding the core of a good metal tune with extraneous fluff to the sped-up Oblivion-esque Mastodon worship of Overthrone, which drives the point into your ears repeatedly when it would make a decent three-minute single. Flood and Fire is probably the closest thing here to a solid track, thrashy and hungry compared to the blissful lethargy of elsewhere, although it still feels rather odd, as if the various sections don’t really fit next to each other. Raise the Sun nearly makes it too, but goes on just that bit too long. As a whole, Heart of Oak sounds good, but it lacks personality. It lacks identity. For the moment, Anciients are a very promising band with the ability to release a truly excellent second album – if they have the guts to cut into their music’s flab. Diet time, boys.